This afternoon, Intel announced their second quarter results for fiscal year 2017, and continuing a trend, they have once again set a record for the current quarter. Intel recorded $14.8 billion in revenue this quarter, up 9% from a year ago. Operating income, which was down dramatically a year ago due to restructuring charges, has rebounded to $3.8 billion for the quarter, up 190% when compared to a year ago when they took the restructuring hit. Gross margin came in at 61.6%. Net income was up 111% to $2.8 billion, and earnings per share were up 115% to $0.58 per share. 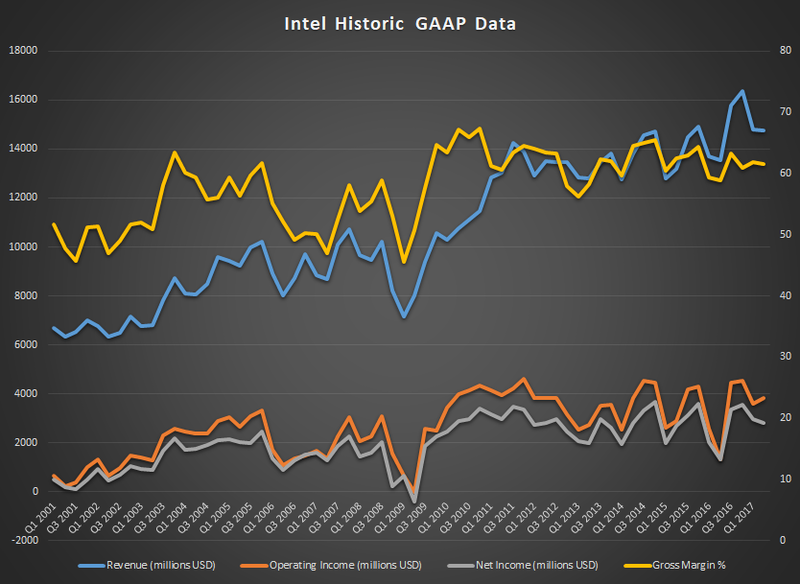 Intel also released Non-GAAP results to account for the restructuring charges, and they give a better look at the underlying business without the wild swings taken into account when there is a large hit to the bottom line. On a Non-GAAP basis, revenue was the same, at $14.8 billion, up 9%, and gross margins were 63%. Not factoring in certain charges such as acquisition costs and restructuring, operating income came in at $4.2 billion, up 30% from a year ago. Net income was up 23% to $3.5 billion, and earnings per share were up 22% to $0.72 per share. Intel’s Client Computing Group, which includes platforms for notebooks, 2-in-1 systems, desktops, tablets, phones, wireless, and mobile communications, had a very strong quarter, with revenue up 12% from a year ago to $8.2 billion. Notebook revenue was up 20% from a year ago, while desktop processor revenue slid 3%. Overall, Intel sold 3% more units in Q2 2017 compared to Q2 2016, and average selling prices increased 8%. We’ve not seen anything yet post 14nm, but Kaby Lake’s improved 14nm process is still very competitive, and was able to boost overall performance without any changes in IPC by allowing higher frequencies in the same thermal design. AMD’s new Ryzen platform doesn’t yet compete with Intel in the notebook space, so this will be interesting to watch, since AMD really has no competition to Core based SoCs at this time. Intel announced on their earnings call that they expect to begin shipping 10nm chips in low volume by the end of 2017, with a ramp up to higher volumes in 2018, so 14nm is still going to be the prevalent process for some time. It could easily be CES before we start to see shipping systems with 10nm, although Intel is currently sampling customers with engineering samples right now. The Data Center Group continues to perform very well, and Intel sees this business having a lot of growth in the future. Revenue for this group was up 9% year-over-year to $4.4 billion. Operating income was $1.66 billion for this group, down 6% from a year ago. The lower margin was attributed to the move to 14nm, which has higher startup costs, and development costs, along with investments in AI. Intel shipped 7% more units, and average selling price was up 1%. We’ve just seen Intel announce the Xeon Scalable Processor Family, and they have had a pretty impressive response to this new branding. Intel shipped over 500,000 units to over 30 customers, which makes it the largest early ship program they’ve ever had. Intel faces strong competition here from AMD though, so we’ll see how the reshuffle their product stack over the next while. Intel’s Internet of Things revenue was up 26% year-over-year to $720 million in revenue. This segment has had some product changes over the last quarter, with Intel discontinuing their Galileo, Joule, and Edison lines, but Intel is still moving forward in this space with other products for industrial, video, and automotive. Despite the shakeup, this group increased its operating income 56% to $139 million. The Non-Volatile Memory Solutions Group had strong revenue growth as well, jumping 57.8% from a year ago to $874 million. Intel is now shipping 64-layer 3D NAND solutions, and they feel they have a competitive advantage there with density. Operating income for this group was still a loss of $110 million, compared to a $224 million loss a year ago, but Intel says that the core NAND business was profitable this quarter, and they expect it to be profitable the rest of the year. Intel Optane has shipped over 200l,000 units so far, and the profitability includes the ramp up of more 3D XPoint memory. Programable Solutions Group, which includes Intel’s Altera FPGA business, had a drop in revenue from $465 million a year ago to $440 million this year. Operating income was almost flat at $97 million. They had growth in industrial, military, and embedded FPGAs, but that growth was more than offset by lower data center revenue for this quarter. Intel is forecasting revenue of $15.7 billion, plus or minus $500 million for Q3, with gross margins around 61%. Intel is on track to deliver yet another record year, with the first two quarters both setting new records for revenue, on the heels of their record setting 2016 fiscal year. They’ve got some strong competition though to compete against, and it should be fascinating to see how the next couple of quarters play out. Intel previously mention 10nm will be Mobile and DC first. My guess Core M 10nm will be shipping with updated Macbook. But what about 10nm on the DC market? For most values of "server" (especially in the datacenter), Intel's only competition was IBM's Power architecture. AMD admitted a marketshare "essentially 0%) before launching EPYC. ARM (despite multiple attempts) has been even less. Sparc still exists, but Oracle doesn't appear remotely interesting in maintaining that fact. Don't forget their foundry business too.